This calculator will forecast the combined household monthly take-home pay for up to eight income sources -- regardless of pay period type. If your household has multiple income sources, each with different pay periods (week, bi-weekly, semi-monthly, etc. ), this tool will help you to see how much spendable income will be available for each of the next 12 months. And finally, you can view and print-out a combined monthly net-income report, or a pay period calendar for each individual income source that you enter. Cool! 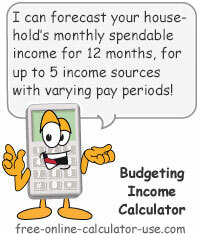 Calculate your household's combined spendable income for each of the next 12 months, for up to 8 income sources. 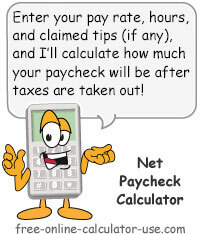 To add an income source, enter the name, the periodic take-home amount, and select the frequency and last pay date. When you're satisfied with the entries, tap the &plus; button (may also appear as "Add" or "Add Income" depending on the width of your device). To edit an income source in the list, tap the radio button in the Edit column. This will load the income source into the form for editing. When you're satisfied with the changes you've made, tap the S button (may also appear as "Save" or "Save Changes" depending on the width of your device). To delete an income source from the list, tap the radio button in the Edit column. This will load the income source into the form for deleting. Tap the − button (may also appear as "Delete" depending on the width of your device). To clear the form to create a new income source entry, tap the C button (may also appear as "Clr" or "Clear" depending on the width of your device). Important! The entered income sources are saved in your device's random memory (temporary storage), which means that if you surf to another calculator or close this browser window you will need to re-enter your income sources. Enter the name of the income source you want to add to your income source list. Enter the average take-home pay per pay period for this income source, without the dollar sign or any commas. Note that this field must have a valid numerical entry for an income source to be included in the income budget spread sheet. Select the pay period frequency for this income source. If you select Semi-Monthly, the days of the month fields in the next row will be enabled. The fields in this row only apply to income sources that are received on a Semi-Monthly basis (twice per month). 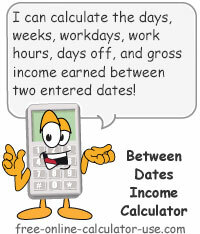 If the income source does have a Semi-Monthly pay period, enter the two days of the month that you normally get paid on. For example, if you usually get paid on the 1st and 15th, enter 1 in the first field and enter 15 in the second field. Select the month, day, and year of the most recent pay day for this source. For example, if your last pay day was on March 24th, 2014, you would select Mar from the month drop-down menu, 24 from the day menu, and 2014 from the year menu. Note that in some cases days of the month over 28 will be set at 28 to accommodate the month of February. For each income source enter the name, amount, pay day frequency, and date of last pay day. Then tap the "Add" button to add the source to your list. Once you are satisfied with your income source list, tap the "Show Net Income" button. This will initially display a combined monthly take-home pay chart for the next 12 months. To view an individual source's 12 month pay day calendar, select the name of the income source from the drop-down menu located above the chart. To print out a copy of any chart displayed, tap the "Printer Friendly Report" button to open the chart in a new window for printing. If yours is like most households, you probably have months wherein more paychecks are received and other months wherein fewer paychecks are received. This is normally due to weekly or biweekly pay periods, seasonal employment, seasonal profit margins, or year-end bonuses and profit sharing. 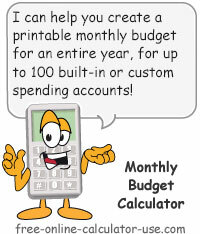 The key is to know ahead of time what your monthly spendable income will be for each of the next 12 months. In turn, this will make you aware of a very important number -- your lowest monthly income. If possible, the goal should be to keep monthly expenditures lower than your lowest income month so that all income over and above that amount can be set aside for non-monthly bills and expenses. Then, once you have sufficient funds set aside for non-monthly bills and expenses, you can apply other extra pay to a rapid debt reduction plan. Imagine how great it would be to have funds readily available when irregular bills and expenses come due, and to be saving thousands of dollars in interest charges because you are paying your debts off ahead of schedule.